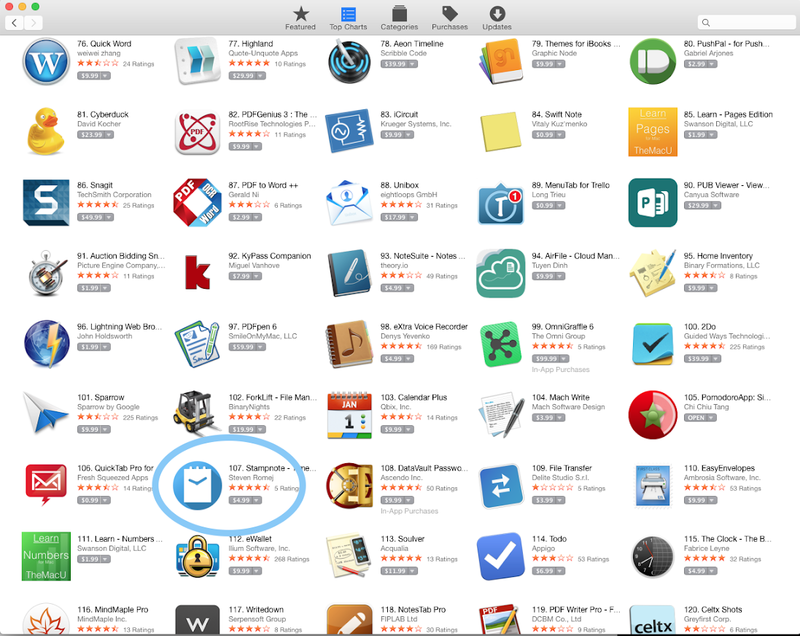 It doesn't take much to climb the Mac App Store charts*, but I'm always happy when Stampnote makes a jump. This morning it was spending time on the charts with hits like OmniGraffle, 2Do, Sparrow, ForkLift, Soulver, and Todo. Awesome company. Prior the OS X 10.10 (Yosemite), the app experienced a long period of slow but steady sales and had a 4.5-star rating. When Yosemite debuted and some users started installing it, the ratings plummeted. One-star reviews started popping up. The app was crashing upon launch. Quite a few helpful customers sent me descriptions of the issue and attached crash logs. I stopped what I was doing and worked on a fix for the rest of the day, did some testing (Mac apps are more difficult to test and I borrowed my wife's computer to make sure my fixes for Yosemite didn't break Mavericks), then submitted the update to Apple. Then, of course, the waiting. Sales slowed to a trickle. I couldn't blame anyone but myself. After the bugfix update, a few customers revised their reviews. That makes a big difference and I'm thankful some of you took the time to do that. A few good days like this put some gas in the tank: I feel more motivated to invest time in new features and it actually starts to become possible from a financial standpoint. * For those interested in sales and rankings figures in the App Store, it's perhaps surprising to learn that you can count the number of sales it takes to jump into the Top Paid charts on one hand. At $9.99 a popular app like Sparrow might be making ~$100/day. Assuming that was steady, it could generate enough to pay 1 developer market rate for about 3 months (of course, it did well initially and was bought by Google...).